Commissioners are elected to in two-year terms to oversee Ottawa County government. Policy County commissioners establish the policies of county government. These policies deal primarily with the agencies of county government and less directly with county residents. County policies deal largely with the county budget, appropriations, personnel, capital improvements, county services and other internal matters. At times they may also pass ordinances. Oversite County commissioners devote some of their time to oversight of the administrators in county government. In so doing, they seek to assure county department leaders carry out their tasks effectively, efficiently and with fiscal responsibility. Constituent Services Commissioners also spend time providing constituent services. Commissioners listen to county government related concerns of residents, help them obtain the services of a county agency, or provide them with answers or information. This involvement with residents also strengthens the oversight function because it gives commissioners a sense of how county programs are working. The Big Picture As the elected body that oversees the entire county budget, the Board of Commissioners is uniquely situated to keep an eye on the future, anticipating changes in society and legislation, and, through their policy setting role, work to keep the entire county operation focused on excellence and cost-effectiveness in their provision of services to citizens. Adapted from a publication of Michigan State University Extension. Francisco "Frank" Garcia graduated from the University of Michigan before moving to Holland with his wife. Once settled in, they had two children, Daniela and Damien, who attended West Ottawa Public Schools. Frank taught for 16 years in Fennville and West Ottawa, while earning a Master’s in Educational Leadership from Michigan State University. After teaching, Frank moved into administration as superintendent of Holland Public Schools where he served for 13 years. As Superintendent, Frank successfully stabilized the district’s shrinking budget, enhanced services and implemented a wide variety of programs that benefitted students and the community. After retiring in 2008, Frank worked at the Michigan Department of Education. Frank and his family have a long tradition of community service. His wife retired from Holland Public Schools after thirty years as an educator. Daniela, his daughter, currently serves as State Representative of the 90th District encompassing the cities and townships of Holland, Holland Township, Zeeland, Zeeland Township, Hudsonville and Jamestown Township. 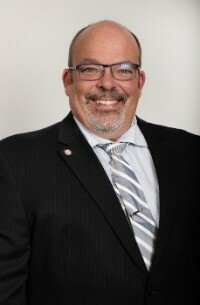 Frank was first elected to represent Park and Port Sheldon Townships as District 1 Ottawa County Commissioner in 2016. 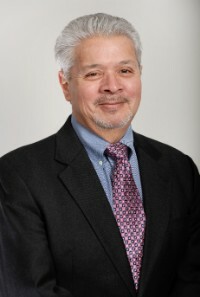 He currently serves on the County’s Planning and Policy Committee, and the Health and Human Services Committee. 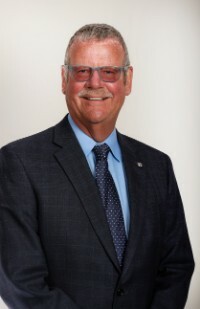 Frank also represents Ottawa County on the Holland Local Development Authority Board, Area Community Services Employment Training Council and the Local Emergency Planning Commission. Allen “Al” Dannenberg has lived in this area his entire life. He is a graduate of Zeeland High School. He retired from Mead Johnson after 35 years of employment there. He is now an Ottawa County Commissioner and a Realtor for FiveStar Lakeshore. He and his wife Barb are members of Haven Church in Zeeland. They have three married children and nine grandchildren. 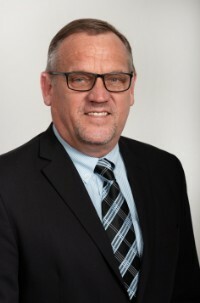 Al has been a Zeeland City Councilman for ten years and an Ottawa County Commissioner since 2013. 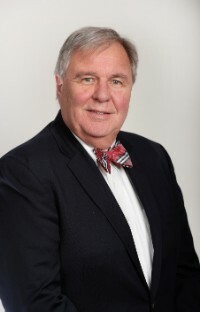 He currently serves on the Health & Human Services Committee, the Talent & Recruitment Committee, the Community Mental Health Board, the Substance Abuse Oversight Policy Board, WEMET, the Lakeshore Regional Entity Oversight Policy Board, the Land Bank Authority, and the Zeeland Recreation Board. In his spare time, he enjoys golf and reading. Randall "Randy" Meppelink is a lifelong resident of Ottawa County, Randy graduated from Zeeland High School in 1984. After school Randy enlisted in the US Navy. He is a retired fire fighter after 20 years with Blendon Township Fire. He also served with the Ottawa County Sheriff’s Marine and Reserve Unit. He served for four years as township Trustee, and then four more as Clerk. Randy has been married to his wife Bonnie for 31 years. They have two sons who also live in Ottawa County. They enjoy boating on Lake Michigan as well as snowmobiling in the winter-time. Randy and Bonnie are members at Community Reformed Church in Zeeland. They have one granddaughter and another grandchild on the way. Randy and his Wife Bonnie own Great Lakes Window Coverings, Window Products Inc. and Global Fabriks LLC. "Having three companies keeps us very busy. We enjoy West Michigan and are proud to have our companies located here." Randy's hobbies also include Hunting, Traveling, and the outdoors. James “Jim” Holtvluwer attended Calvin College and Ferris State University and holds a BA in Business Administration. Jim spent over a decade as a partner in Jurgens and Holtvluwer Menswear in Jenison. He also worked many decades in commercial and retail real estate sales and leasing. 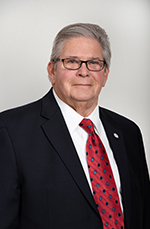 Jim was a board member of Georgetown Charter Township before serving as the supervisor for four years. 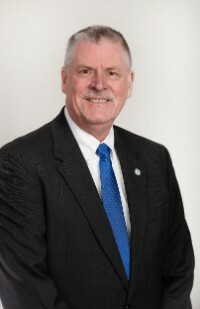 After his time in Georgetown, he was elected to the County Board of Commissioners where he has been serving since 2006. As commissioner, Jim is on the Mental Health Board, the Parks Board and the Grand Valley Metro Council. He also serves the community on the Visser YMCA Board of Directors and as a deacon, administrative elder and facilities chairman for Ridgewood Christian Reformed Church. Roger was born in Holland, and attended Holland Christian schools and Hope College. In 1966 He started working at Borr’s Bootery and met his wife Karen that same year. They soon married and started a family after moving to their first home ten miles south of Holland in Allegan County. When Borr’s opened a new store in Grand Haven, they moved north and followed the store to the city. In addition to being involved with the merchant's organization, they soon became active in starting a new church. At the same time, Roger was the legal guardian for two mentally challenged older brothers as well as was co-director of a financial planning ministry. In addition to this, Karen and he were raising two boys, Nick and Bryce. In 1998, Roger was asked to run for Grand Haven City Council and in November of 1999 was elected to the four-year term. 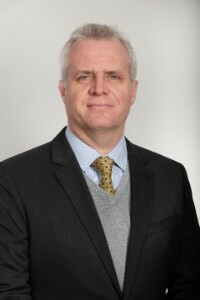 In 2003, Roger Bergman was elected as mayor for the following eight years. After serving Grand Haven City, Roger decided it was time to try something different. 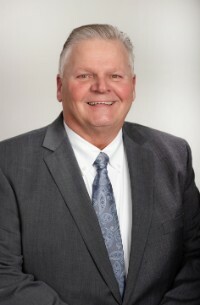 Since both Denny Swarthout and Jane Ruiter were retiring from their county service, Roger decided to run for the 10th district seat on the Board of Commissioners and has been on the board since. He sold the shoe store many years ago but still works for them doing the books, making his service to the merchant 52 years! As Roger looks back at this time, he sees how God has blessed him and my family in so many ways and is thankful. Matt Fenske is in his third term as a county commissioner. Prior to working in Ottawa County, Matt had a 33 year career with the 17th Circuit Court in Kent County. Matt had performed in almost every capacity within the Circuit Court system finishing as the Superintendent of the Detention facility. 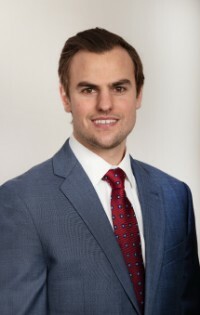 Matt earned his Bachelor of Arts Degree in Criminal Justice from Michigan State University and a Masters of Counseling and Personnel from Western Michigan University. Matt's interest in local government began when he moved from Grand Rapids to Tallmadge Township in 1992. 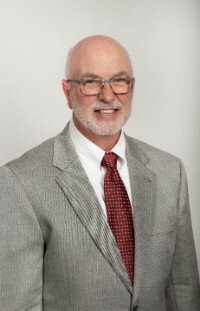 He has served on the Zoning Board of Appeals, Board of Trustees and on the Planning Commission since 1995 to the present. Matt has been involved in numerous professional and service organizations with the most recent one being the establishment of the first Kiwanis Chapter in the Coopersville area in 2016. Matt has two children living outside the state. His son Tyler and his wife Alison live in Cambridge, Mass. His daughter Molly lives outside Des Moines Iowa. Matt enjoys doing pretty much anything that brings him in the great outdoors. Always has a vegetable garden, makes great hot salsa, loves to hunt and hike but is especially passionate about his horses. Best and favorite vacation spot for Matt and his family to visit and camp is the south end on Beaver Island, Michigan. Meetings of the Board of Commissioners and its Committees are open to the public. The Board meets the 2nd and 4th Tuesdays of each month at 1:30pm in the Board Room at the Administration Building: 12220 Fillmore Street, West Olive. The Board Rules contain more information about the structure and dynamics of meetings. Each meeting opens and closes with an opportunity for public comments. Since comments are limited to three minutes per person, it is helpful to come prepared and be succinct. You can also contact your Ottawa County Commissioner at any time. 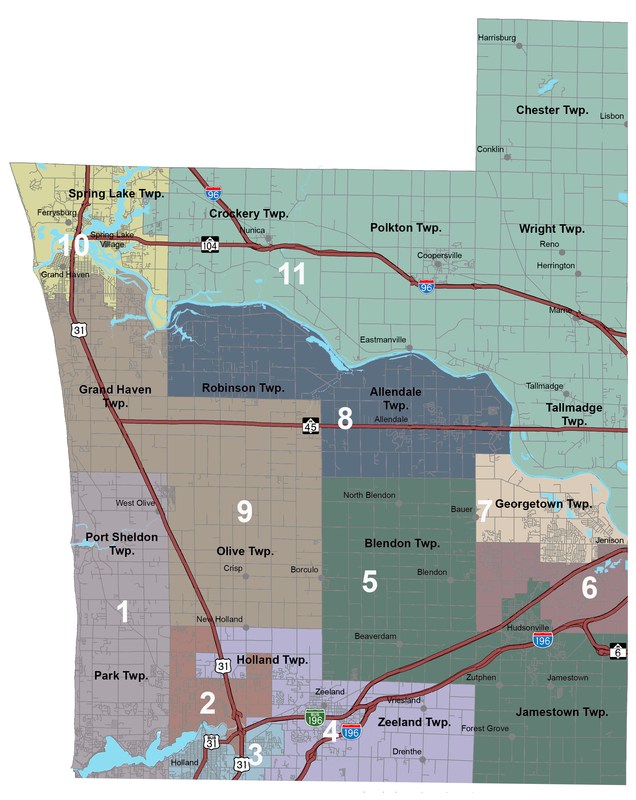 If you are unsure which district, precinct or ward you reside in, this map can help.